Tired of searching for misplaced iPods or iPhones? 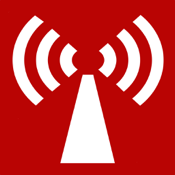 Last Alert will notify you when the battery runs low. * In case you miss the alarm, you will also be sent an email with the last known location of the device. Now you will know where it was when the battery died! Seriously, how great is that? Additional tools allow you to view the location on a map, or track it down with the new Radar view! - More than 65,000 email alerts sent! - Thousands of missing phones found! 2.) 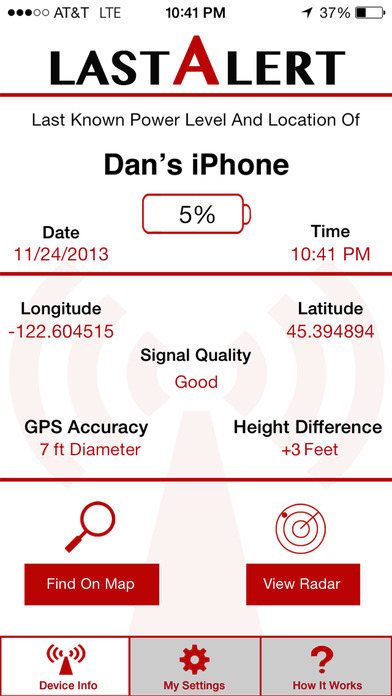 Email Alerts - in the event of a dying battery, the app will send out an email with last known GPS coordinates. Choose up to 3 email notifications (20%, 10%, 5% etc.,) Open the email on a computer, click the link and see the location of the device on a map. 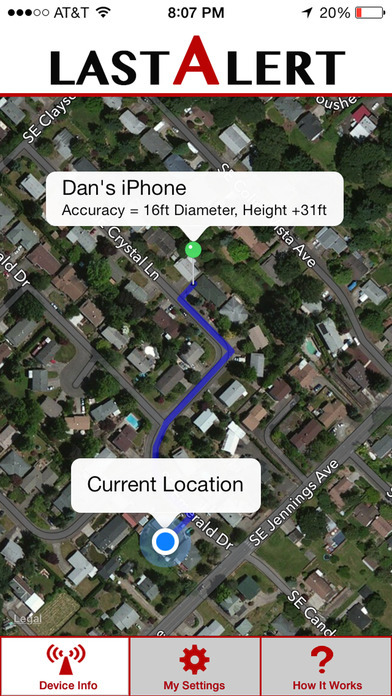 Last Alert compares the distance between the two devices, and tells you where to go to start your search. We also compare elevation information to help you determine if the missing device is on another floor of your house or apartment building. A sonar-style "ping" increases frequency, as you get closer. Yes, there are plenty of battery and GPS apps out there, but nothing that provides all this functionality to help you find your missing device AFTER the battery has died. Kind of like good car insurance...you will really appreciate it when you need it. *Last Alert will need to be launched manually. For this app to run in the background, Apple requires GPS to be on constantly, which can produce a noticeable drain on the battery. **Due to the lack of hardware (magnometer), the radar feature is not available on iPod Touch. ***The accuracy of both the map and radar features are reliant on the coordinates provided by your device. Average accuracy varies between a 5ft-30ft radius. Weak or obstructed signals, and other environmental limitations may further degrade accuracy. Regardless, we will attempt to provide you with a starting point to begin the search.